Is it seriously Wednesday night/Thursday already? Where did this week go?? Red Hen Home made this freaking awesome suitcase wall. 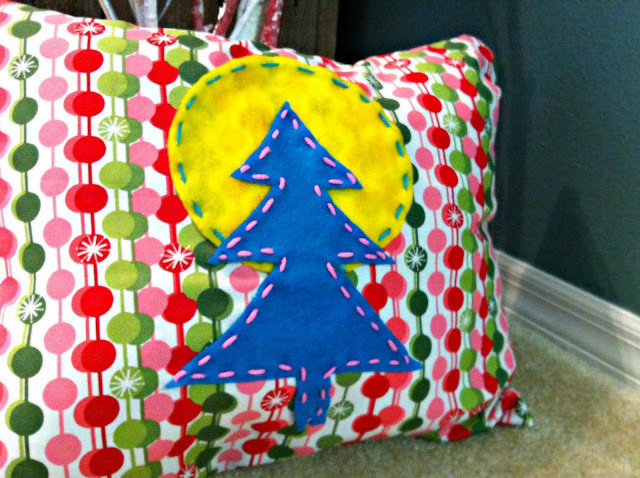 Check out this fun bright festive pillow from The Late Young Family. 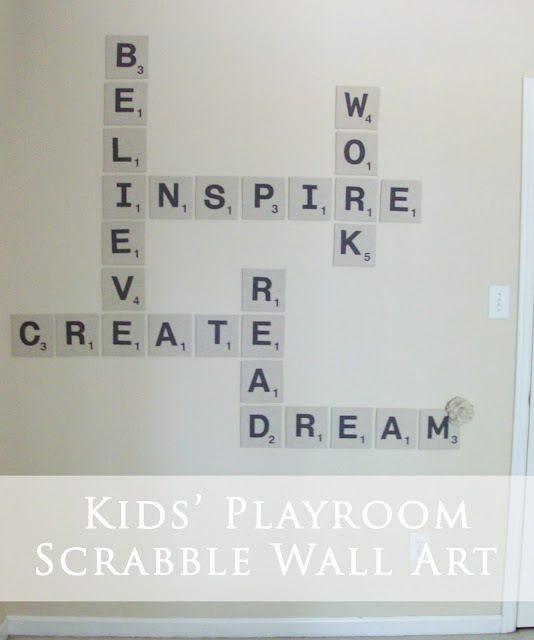 Attempting Aloha made this huge scrabble wall art. How fun. Find some great storage solutions for all those pesky legos and little toys over at Being Brook. I’ve seen these dollar store candle stick and vase combos a lot, but I’ve never seen a PINK GLITTER one! Woop! There it is. I am totally freaking out and loving this sparkly hurricane by The Crafted Sparrow. You don’t always need a new idea; just a new twist! And this twist is freaking fabulous. Before Meets After redid their kitchen and I was literally all Joey on it going, “Wow. Wow. 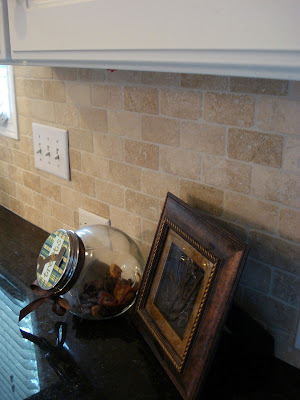 Wow.” I love subway tile, and this tumbled stone is rockin’ my socks big time. Like I said before, you don’t always need a brand new idea, just a new unique twist. Check out this very unique AWESOME twist Imperfectly Polished gave to their dining room – barn style wainscoting. Lurve it. Like, a lot. Scattered Thoughts of a Crafty Mom blew me away with this beautiful dress she made. I am so loving all the pretty colors together. Any little girl would love to be a princess in this number. Dude. This post is brilliant. 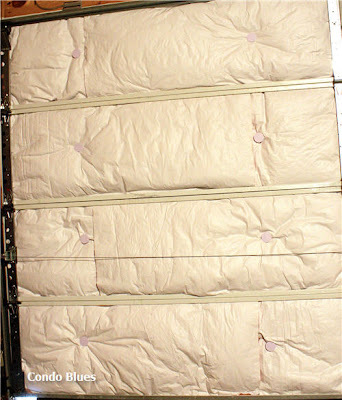 Yes, pictures of a garage door aren’t the prettiest to look at, but if you are sick of having a co-ooo-oo-o-old garage, check out Condo Blues post on how to insulate it. You know, so you can be warm again. Especially if you are wanting to turn the garage into a work space. A Home Made sewed this fantastic skirt. I’m seriously dying over the puffed part of it. My daughter would be all coo coo for cocoa puffs over this skirt. Just when I thought I was finally getting a plan together for my sons room, Burlap & Denim goes and shares this amazing huge map painted on her son’s wall. Scrap my previous plans. I now want a huge map on my son’s wall. Smith Peas in a Pod shared her son’s nursery which by the way is so fabulous, but I especially love the way she framed his name. Such a pretty idea. Oh-em-gee. Seriously. Just stop. I can’t handle it. A freaking awesomespice FUR initial. I.must.have.this.or.I.will.literally.die. And thanks to Craptastic and her simple tutorial, now I can have one. Yippie! These Moments of Mine made me feel really dumb (but in a good way). Why have I never thought to hang stuff on my wall like this? Go read her post. She gives the most simple solution for hanging stuff straight. Never again will I use a tape measure and math. ick. This way is much easier. As always, thank you for hosting. I know what you mean about how fast the week has gone…it feels like I was just checking your blog yesterday. I love the feature about the suitcases–so cute! Oh my gosh! I will never put ten million holes in my wall again trying to hang things! Love all the features tonight!! Thanks for my H letter!! 🙂 Have an awesome week! Hi Allison! I’m totally gonna check out how to insulate my garage…that’s my only workspace and it’sa gittin’ cold here. I’m super excited to link up my Reclaimed Truss Headboard/Curtains! It’s my first BIG project and, love it or hate it, it’s certainly one of a kind! Thanks so much for the party! Your so sweet to host it for us! Allison, these are all really great features! Thanks so much for hosting each week. Glad to link up! Thanks for the feature, and thanks for hosting! The days just fly by, don’t they? now I want that map wall too!!! That bright and cheery pillow is a.dor.a.ble! thanks for hosting! tons of great ideas and features. i *may be coveting that furry ‘h”! Thank you so much for hosting another party! I loved some of the Thanksgiving printables-can’t wait to go and check them out! You rule! Let me start by saying that I LOVE LOVE LOVE reading your blog. Like really LOVE it. I just wish the image sizes were not half an inch square on the linky parties. It makes everything hard to read on my 19 inch monitor. This will be my first time linking up! Thanks for hosting! 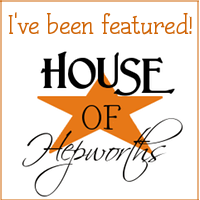 Thank you for featuring my garage door project! I can already tell that the insulation is working. Thanks for the awesome party, as always, Allison! Linking up my easy scrapbook paper “ladybug” invites I made for my daughter’s upcoming 1st birthday party (#412). SO fitting considering her name is Adelaide, and her nickname is “Laidybug” (get it? har…ahem). Hi! thanks for hosting! very new follower. nice meeting you and see you more often. Thank you so much for hosting! I have been a long time follower, but this is my first time posting to one of your link parties. It is so much fun to check out all the linked up posts! As always, thanks for hosting such a fabulous party! Thank you so much for hosting these parties! I have so much fun going through them and it’s nice to see others visiting mine. I was lucky enough to finish another project this week, so I’m going to go link up again!